When I worked as a bookkeeper/go-fer/personal assistant for glass artist Dale Chihuly, my office was in a beautiful space with an incredible view of Lake Union. It was the former home of the George Pocock Racing Shell Company, Inc. that Dale had purchased, renovated and named the Boathouse. Like Artist Andy Warhol, Dale liked to have names for the places where he made art. He also named several of the rooms in the Boathouse as if they were people, taking on characteristics of human beings with their own personalities. After a particularly stressful day doing accounting for the mercurial artist, (truthfully, every day doing accounting for me was stressful, numbers are not a favorite of my creative brain) I came home frustrated because Dale had decided on names for all the rooms in the Boathouse, but didn’t share that information with me. He then got upset when I didn’t refer to one of the spaces with the proper name. When we moved to our next home, Leroy moved with us. We had expanded our family to four and this home had a fourth bedroom that we used as our Leroy. At times Leroy was the home office. Leroy was also used by the kids to play video games and hang out. When their friends came over, we would tell them, “They’re playing in Leroy,” and all the neighborhood kids knew where in the house to go. When my mom was sick and needed to stay with us while in recovery, Leroy got a makeover. I put more feminine touches with softer colors to make my mom feel at home, but it was still Leroy. My mom got better and moved back to her home, then my nephew came to live with us and occupied Leroy for almost a year, but it was still Leroy. Three years ago we decided to downsize. Not that our previous house was that large, but we felt like we weren’t really using all the space that we had, the market was up and we really wanted a home that we could renovate and make our own. We bought a smaller house with three bedrooms and no room for Leroy. Leroy looking a little sterile in the pictures for the listing of the house. In December, my oldest child decided to move out of our little nest. This meant, not only were we on our way to being empty nesters (one down, one to go!) I got to redecorate another space, and Leroy could move back in! Leroy has always been the "child" that gets the hand-me-downs, sometimes even the cast-offs from the other more, dare I say, loved rooms of the house. While I decided not to put a lot of money into New Leroy, I did want to show the space a little love. After all, New Leroy does have a function and has already proved his worth by hosting guests during the holidays. The Seattle pictures are the first pieces of art my husband and I purchased together. I started with a futon given to me by a friend. I added color and personality with artwork, accessories and pillows. 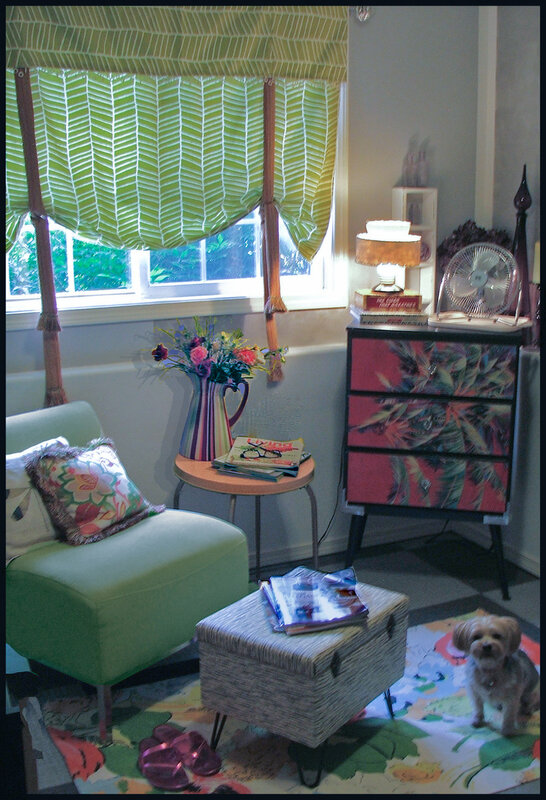 All of the accessories, lamps and tables were items that I took from other rooms in the house. I did, however, purchase a new rug and a trendy new faux fur ottoman. The artwork on this wall was a thrift store find that I "doctored" to make the colors a little more vibrant. I found the "L" on a recent trip to Portland, before I even knew Leroy would be back! For less than $200, we now have an updated New Leroy that is fun, functional and ready to host more guests. Don't be surprised if you come over and my husband says, "Leigh is hanging out in Leroy." Do you have a room in your house that isn't living up to it's full potential? Drop me a line. I can help.